We were up against it last night, facing Kings Head – top of the League and the clear favourites to win the game, but nothing was certain. No quarter was given and Hammersmith did not succumb without a struggle. On Board 1, Brian Dodgeon with the Black pieces got to defend against a ferocious 3 pawns abreast attack in the centre – did someone say a Maroczy Bind?? After an exchange or two, there was a Knight fork against King and Rook, so Brian ended up a Rook down, capitulating soon after. Bad luck! Board 3 saw David Lambert getting to an equal position with two Bishops and Knight on both sides, and symmetric pawn positions. An early draw was agreed soon after Brian’s loss on top board. Board 4 saw our winningest player, Chris Moore (4.5 out of 5 matches so far this season) go two pieces down but still making a fight of it. In the endgame his opponent – who out-graded Chris by 15 points – had both Bishops and Rook buried behind jammed-up pawns, but got into time difficulties. So it looked for a while as if a two piece deficit could be ignored. Sadly the game was lost when the Rook and Bishops finally emerged. 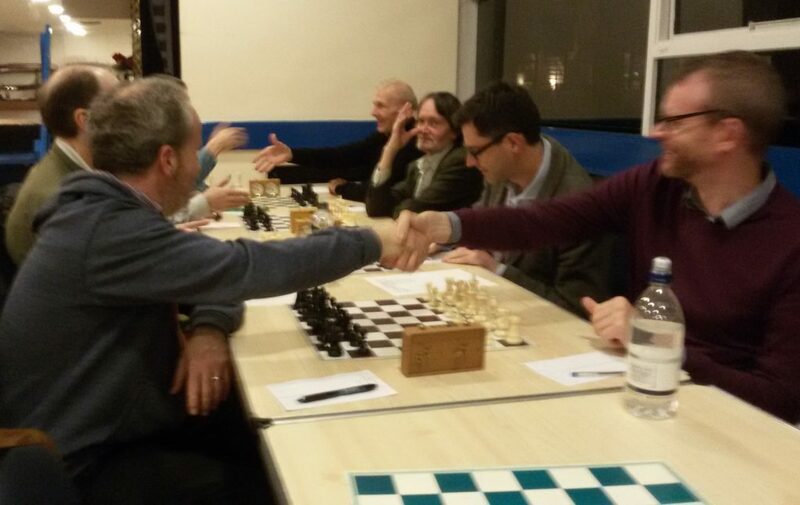 Our hero of the match was John Woolley on 2nd board, who had a might nice English opening, and both sides looking very solid. Suddenly, John launched a pawn break in the centre, which caused an exchange of several pieces. This led to John’s Rook pinning an undefended Knight against the Queen, and the win looked good. Somehow though, John’s opponent managed to wriggle out and a draw was agreed. John looked close to winning – better luck next time! All things considered, not a bad result against a strong side.